Based on the popular web cartoon by Lee Jong-gyu and Lee Yoon-gyun, Fists of Legend (전설의 주먹) is the latest offering from prolific film-maker Kang Woo-seok (강우석). The premise is a simple one; three middle-aged men who were friends in high school find themselves down on their luck and, tempted by the prize money offered by a TV fighting show, find themselves reunited in the ring. As such the film evokes a Rocky Balboa/Warrior sensibility, with a dash of classic Korean gangster film Friend (친구) thrown in for good measure. Yet Fists of Legend never gets anywhere close to the quality of what inspired it, with a cliched and hackneyed narrative, awful TV drama-esque acting, and complete mis-use of the principal cast, while the overly-long running time adds further tedium. Luckily veteran actor Hwang Jeong-min (황정민) is on hand to elevate the film out of monotony, alongside the interesting flashback sequences. Yet there’s no escaping the fact that Fists of Legend is a big disappointment, and beneath all of the lead actors involved. Tough, cynical producer Hong Gyu-min (홍규민, Lee Yo-won (이요원) presides over a TV show which pits middle-aged men – who were ‘legendary fighters’ back in their youth – against each other in a mixed martial arts ring for entertainment. 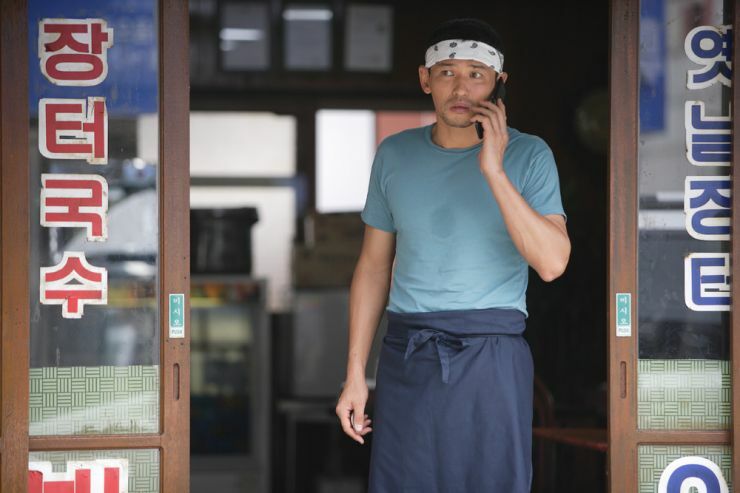 After receiving a tip-off, Gyu-min tracks down gentle noodle restaurant owner Im Deok-gyu (임덕규, Hwang Jeong-min (황정민), who was known as a talented boxer in his youth. In need of money following an incident involving his daughter, Deok-gyu reluctantly agrees to fight and surprises everyone when he emerges victorious. However his winning streak starts a series of events that sees former friends and rivals in the form of salaryman Lee Sang-hoon (이상훈, Yoo Jun-sang (유준상) and gangster Shin Jae-seok (신재석, Yoon Je-moon (윤제문) enter the tournament, while the unearthing of his checkered past brings difficulty for Deok-gyu and his family. Fists of Legend begins well as it gloriously parodies middle-aged masculinity, featuring high-octane action sequences of svelte teenage fighters who give way to their chubby older counterparts battling on TV. The subversion of the action genre is highly entertaining as the fighters, described as teenage legends, are publicly beaten and humiliated as they attempt to prove their manliness. The comedy derived from such sequences is a fun way to introduce the concept of the show, and sets up the narrative well for the introduction of the central protagonists. Yet the film falters almost immediately in doing so as Lee Yo-won ridiculously overacts as producer Hong Gyu-min, spouting clunky dialogue about her resilience and tenacity as well as what constitutes a ‘real man’ in the attempt to recruit Deok-gyu for the show. Deok-gyu is, for all intents and purposes, the Korean Rocky Balboa; not particularly bright yet kind-hearted, widowed, and with a precocious child, the aged fighter is down-on-his-luck in every respect. Actor Hwang Jeong-min injects real heart into the role, squeezing every nuance he can muster from the character to generate sincere charisma and likability. His quality is such that whenever he comes into contact with other characters the result is often cringe-inducing, as the overacting by the supporting cast – especially Lee Yo-won and Deok-gyu’s daughter – appears even worse next to Hwang’s calm and mediated approach. Indeed, it is largely due to Hwang that Fists of Legend is engaging at all, as the journey he undertakes in which he is forced to reevaluate his past is compelling as well as adding depth to Deok-gyu’s predicament. In order to fully articulate such self-reflection, director Kang repeatedly whisks the audience back to Deok-gyu’s past to convey how he and his friends came together. The veteran director crafts the drama well, so much so that he appears to be more invested in the flashbacks than the current crises as so much of the running time is focused on the formative years that the impetus of the fighting tournament is almost lost. Experiencing the developing friendship between Deok-gyu and his friends, as well as their eventual parting of ways, are some of the genuine highlights of the film yet the sequences feel at odds with those in the present. It’s as if two screenplays are being forced to coalesce but only partly manage to do so, and the result is a film that is at least 30 minutes too long. Furthermore, as the pace in the modern era falters in the second act, contrived features are added to the past in the attempt to flesh out relationships and dramatic tension for the fights in the present, but ultimately feel tacked on. With such a large focus on Deok-gyu, it’s easy to forget that his two former best friends are also in the tournament. The lack of characterisation – on the adult counterparts at least – is a genuine shame as actors Yoo Jun-sang and Yoon Je-moon are highly competent performers, yet they are given such slight material to work with that they barely register throughout the film. This also serves to remove any kind of dramatic tension for the battles between them which is disappointing given that the hype generated for the contest of champions is enormous, yet they ultimately have little legitimate reasoning for wanting to fight each other. The tournaments are anticlimactic for a number of reasons, notably for director Kang’s limitations when filming action. 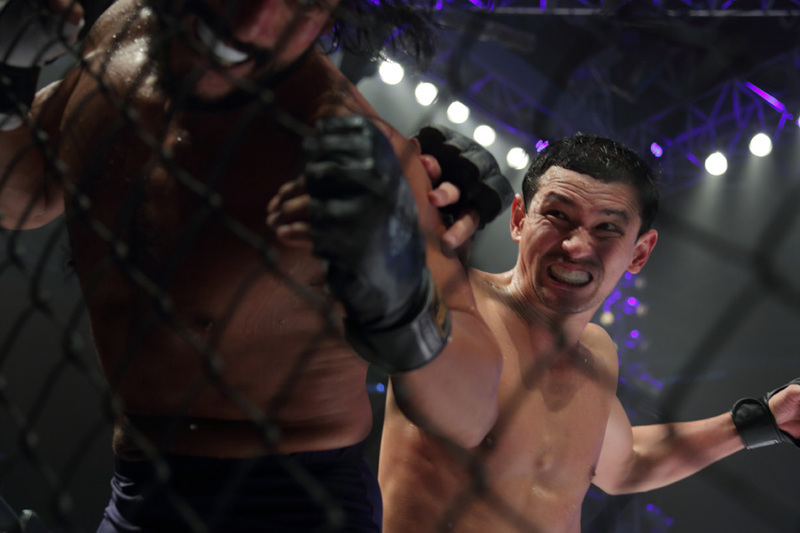 Aside from one shot, in which the camera rolls with the fighters during a takedown, the action is bland and uninspired while the notion that these middle-aged men could somehow become mixed martial arts specialists almost overnight is just silly. The cliches that enter the film during the fight sequences, such as rousing music when a character becomes angry, are reminiscent of 1980s action films yet without the self-reflexive tongue-in-cheek attitude to make them work, and become laughable as a result. The inclusion of Survivor’s ‘Eye of the Tiger’ compounds the film’s 80s sensibilities further but it just serves to remind the audience of the superior Rocky series of films instead. Yet despite such criticisms, Deok-gyu’s bouts are compelling due to Hwang’s performance, and there’s always something cathartic about an underdog rising up against insurmountable odds. Fists of Legend (전설의 주먹), by veteran director Kang Woo-seok (강우석), is an odd action film that attempts to combine the themes within Rocky, Warrior and Korean classic Friend, in depicting a fighting tournament for middle-aged men. Yet with clunky dialogue, awful over-acting and an overly-long running time the film doesn’t achieve anything near the films from which it takes inspiration. Luckily Hwang Jeong-min’s performance is the saving grace of Fists of Legend, and his underdog story gives the film the compulsion it so sorely requires.